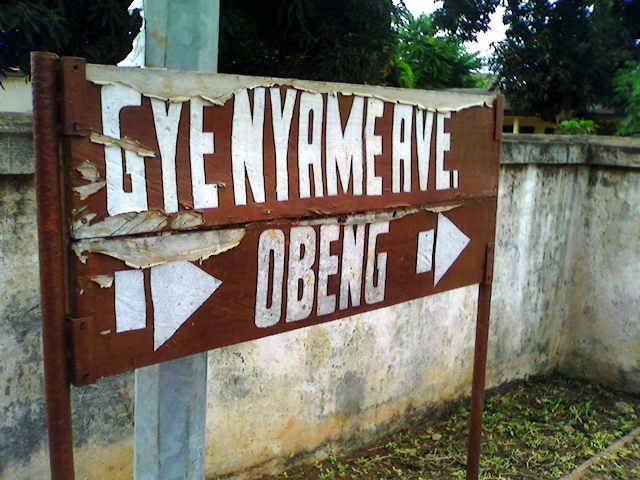 Ghanaians put up the marvelous signs. Some quote the Bible, others have Christian motifs, or are based on traditional proverbs. Some relate to a personal experience of the owner. There is a book of them: Joe’s Hair that Talks. I even produced a few copies of my own book of Ghana signs. Many signs are in Ghanaian languages, which makes it hard to share them, but I love that they value their languages. It would be easy to criticize these signs. They promise more than the business or church can deliver. But, it seems to me that they can best be understood as expressing aspirations. 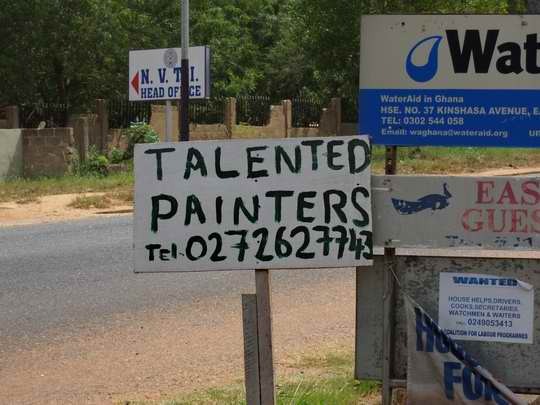 Ghanaians are not satisfied with the things as they are. They want their businesses, their communities, their churches and their country to be something more. They put those aspirations, perhaps unrealistic, on their signs. Big aspirations and lots of struggles. Seems like a good combination to me. If I were to summarize the soul of Ghana, that’s what I would say – big aspirations with struggles. My prayer is that their aspirations for themselves align with God’s aspirations for them. I know in my life, that is a struggle all its own. Giving Christmas hampers is a UK tradition, apparently. At least I think that is where urban Ghanaians got it, Ghana being a former British colony – The Gold Coast. In any case, it is a tradition in urban areas to give a Christmas hamper to each of your friends. Businesses give them to customers, suppliers and partners. We see them in the stores, place prominently near the checkout lanes – baskets full of canned milk, sparkling juices, cookies and other goodies. They can be expensive, easily reaching 150 cedis, or about $70. Some are quite a bit more expensive than that. Apparently there are people and businesses in Accra whose income allows them to purchase and give away a number during the Christmas season. Apparently, government offices got into the tradition as well. A nice hamper for one’s boss might help your career. Then some offices started using public funds to purchase the hampers. 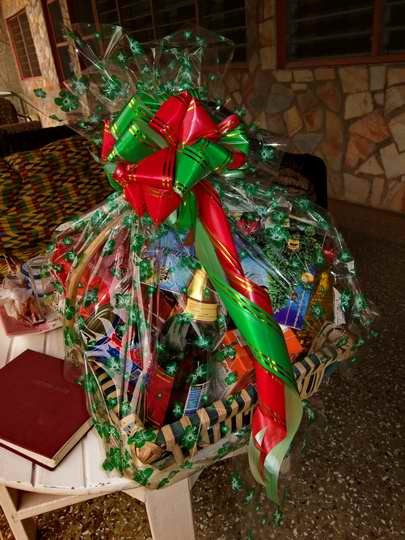 The President of Ghana has responded by banning government offices from using public funds to purchase hampers for gifts. He has said that any official caught doing so will have his or her pay docked for the amount plus a surcharge. Good leadership at the top. I like it. The Ashanti chief, adorned with gold bracelets, rings and chains, closed his eyes, bent his head down and chanted a prayer to the health and fortune of the squirming 3-month-old boy before him. Nana Adu Adjei, a 57-year-old Ghanaian, had donned his green, yellow and royal purple kente cloth for an ”outdooring”. But you don’t need to be in Ghana. The scene described above took place in New York City and was reported in the New York Times. Among many peoples of Ghana and elsewhere in West Africa, a baby is kept indoors until he or she is eight days old. The baby is then brought outdoors for the first time in a ceremony called an “outdooring”. It is the occasion for a party with friends and family. In many cases the baby receives its names at this ceremony and in some cases, male children are circumcised. A word like “outdooring” is a Ghana-ism. It was born out of the contact of the English language with cultural realities for which English has no words. The word “christening” really doesn’t fit. English is the official language of Ghana which inherited it from the colonial period when Ghana, then the Gold Coast, was a British colony. 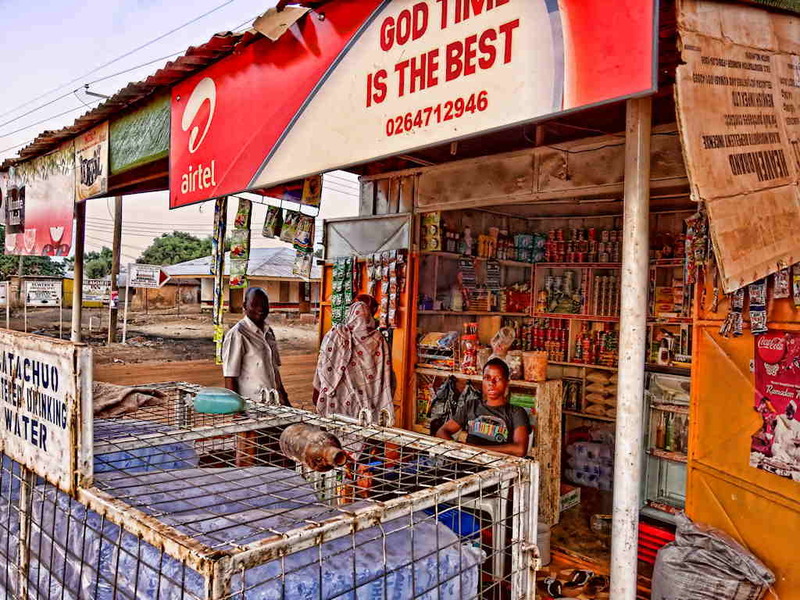 But there are over 60 languages spoken in Ghana, and very few Ghanaians speak English as their first language. They learn English in school, use it in government business, but speak their own languages in their families and in their communities. They continue to follow their many helpful traditions even when they profess a world religion such as Christianity. English does not have words for many of the things that they hold dear, or just want to talk about. So they have invented new English words, or they sometimes use standard English words, but with new meanings. Culture is a powerful force – so strong that a local culture can bend a world language like English to fits its needs, rather like gravity can bend light. When that happens, some mistakenly say that Ghanaians are not speaking English correctly. As I am writing, my impoverished spell checker has mounted a campaign against “outdooring”, suggesting that I replace it with “outpouring”. That Ashanti chief in his traditional regalia could teach it a thing or two about a proud part of Ghanaian culture. 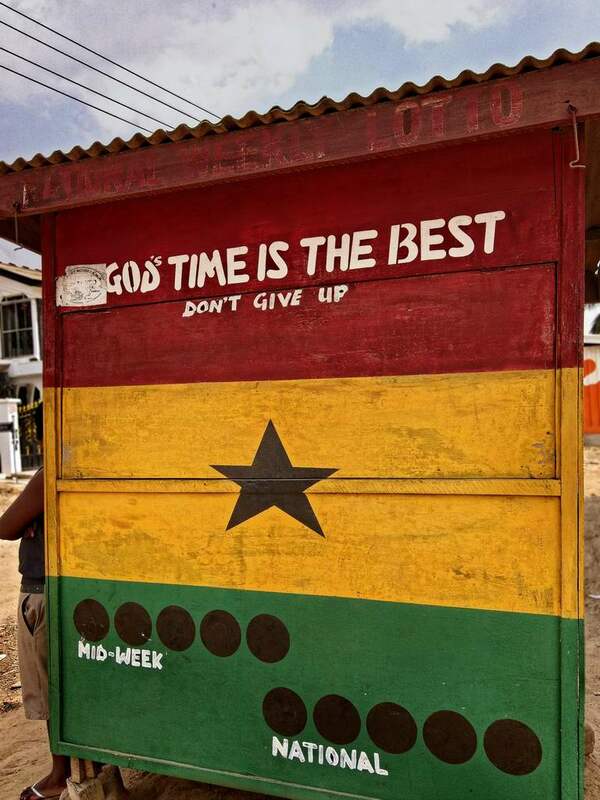 I was attracted to the bright colors of this roadside booth painted like a Ghana flag. I didn’t really notice the words painted on it until I was looking at my photos of the day at home. 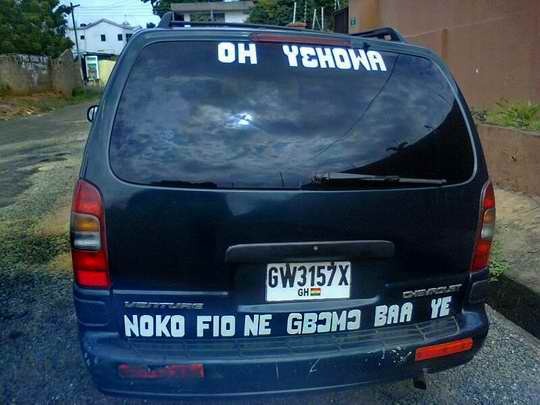 Ghanaians express their religion and feelings about life in sayings they put on their businesses, taxi windows, and more. In this case, the owner has pressed his religious beliefs into a commercial use. You see, this is a private booth which sells tickets to the national lottery! It is obviously in the economic interests of the owner that the buyers “don’t give up yet” and that they keep hoping for “God’s time”, which would be when they will win the lottery, of course. It is easy to criticize this commercialization of religious belief, and even some missionaries get stuck in critique mode. In this case, if I am honest I have to admit that I tend to bend my beliefs to suit my needs and wants. It really is no small matter to let our beliefs frame our economic survival and not the other way around. 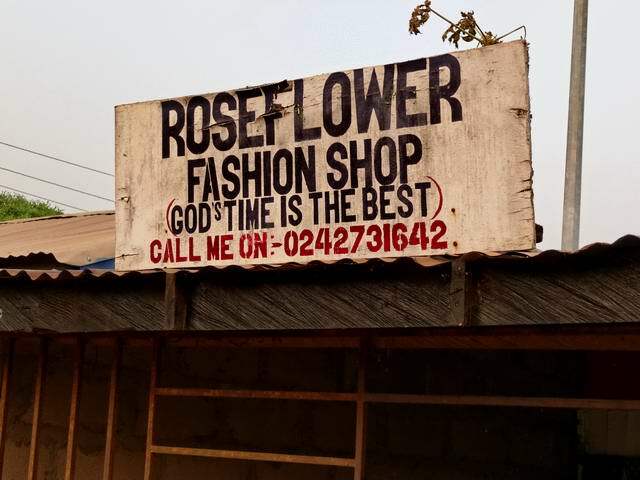 Besides, the statement “God’s time is best” almost surely expresses genuine sentiments, especially judging by the other businesses sporting the same words. 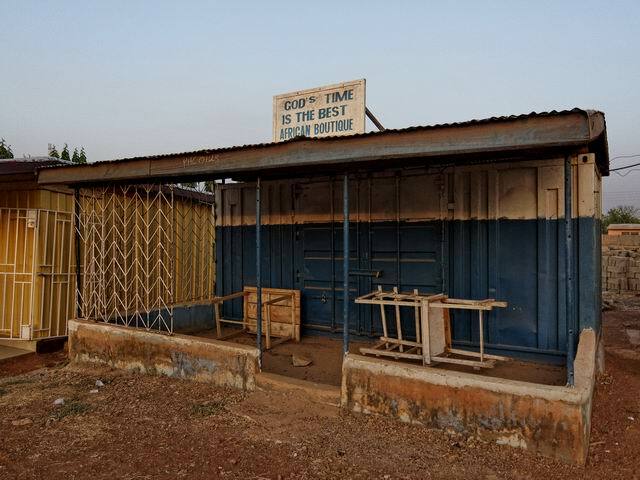 Did you know that the people of Ghana knew a lot about God before the missionaries came? • Everything comes from and depends on Him. This next symbol is about the power of God to overcome death. It come from the Akan belief that God created life and death, but death killed him. However, he came back to life and now he lives forever. This set of beliefs has too many parallels to the death and resurrection of Jesus to mention in a blog like this. 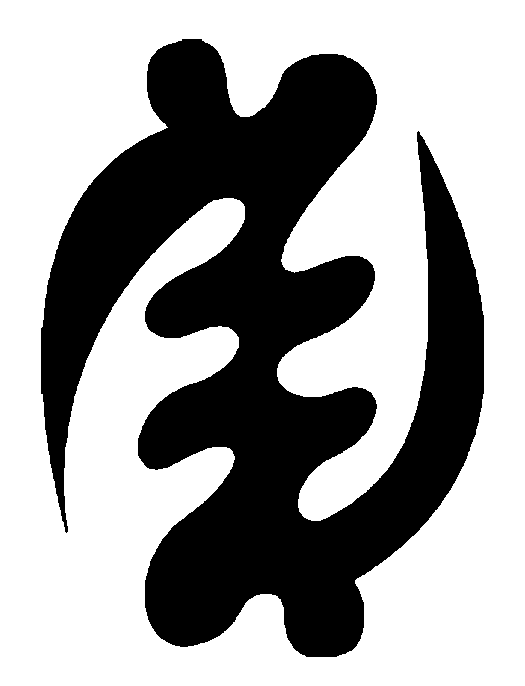 Given that the Apostle Paul developed a whole theme from an idol to an unknown God in Acts 17, I have to wonder what he would have developed from this symbol if he had come to Ghana. 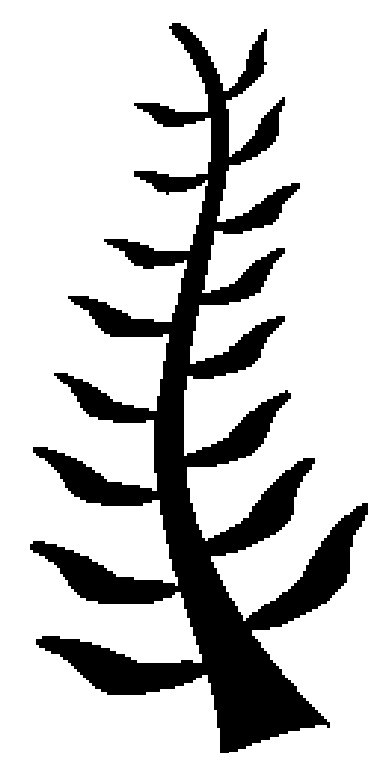 This branch stands for the Akan words “Nyame Nti”, meaning “by God’s grace”. 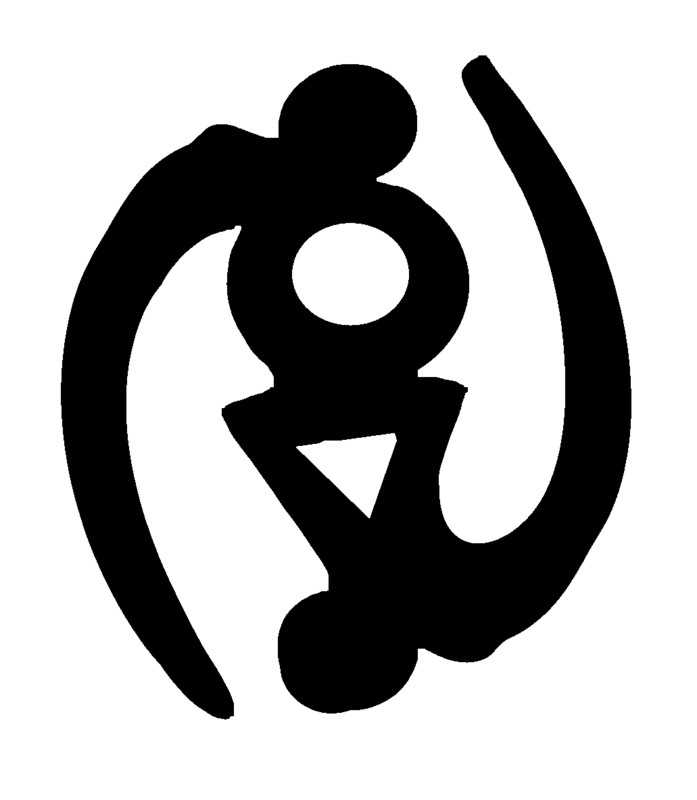 From their belief that “Except (for) God” (first symbol) there is nothing and the obvious observation that man will die without food, the Akan people deduced that they could not survive without the food that God put on the Earth. From that, they further deduced that we humans live by God’s provision and so by his unmerited favor, or grace. In this, they are a lot more like the first settlers to celebrate Thanksgiving than a lot of Americans today, who are thankful, but may not attribute their bounty to God’s doing. A modern-day missionary, Don Richardson has developed this idea further in his book “The Peace Child” from which a movie was made. The image projected of Africa as “the dark continent” is way off the mark. God was at work here and he still is. Africans are responding to that in record numbers, finding in Christian faith the fulfillment of the thoughts God put in their ancestors. I’m thankful to be here and see it firsthand. Enter your email address and click 'Sign me up!' and you will receive an email notifying you of each new post.